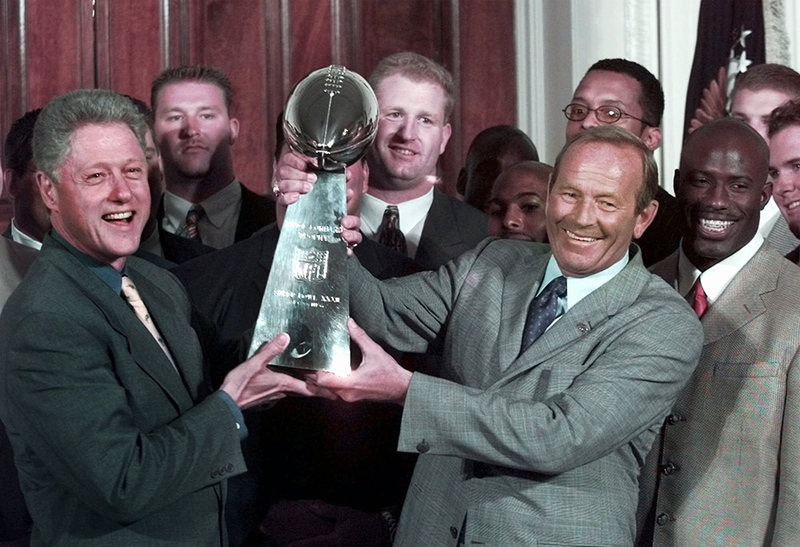 Denver Goes to Washington, D.C.
President Clinton and Denver Broncos owner Pat Bowlen hold the Vince Lombardi Trophy during a ceremony at the White House Tuesday June 16,1998 where the president honored the Super Bowl XXXII champions. Super Bowl Most Valuable Player Terrell Davis is at right. The Denver Broncos travel to Washington, D.C., for a special ceremony in which they are honored by President Bill Clinton at the White House for their victory in Super Bowl XXXII. Terrell Davis delivers to the President a Broncos jersey number “1” with “Clinton” on the back.